The Roland FR-4XB V Accordion features reassuringly traditional sounds and response, but despite this is a model for the modern age. Providing tradition from its expression to its portability, the new FR-4XB model invites its players to explore where Roland's acclaimed range of digital v accordions could take their unique performance skills. Featuring a light and compact design, responsive pressure-sensing bellows, and full-range onboard speakers the FR-4XB feels just like your favorite acoustic v-accordion. 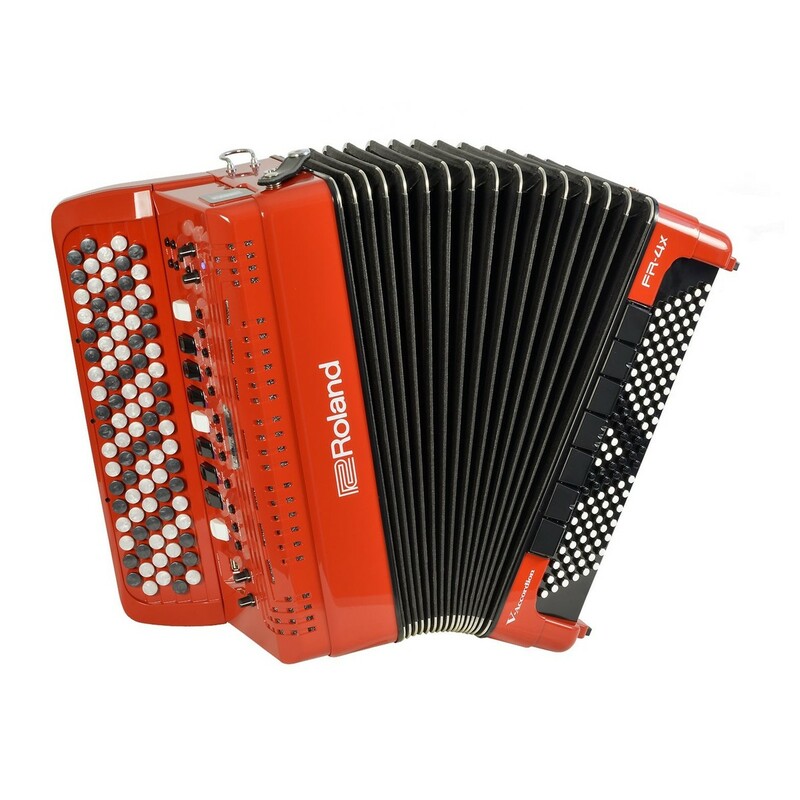 The FR-4XB v-accordion presents the same powerful sound engine as Roland's flagship FR-8XB. Choose from a wide selection of accordion sounds from around the world, and play in silence using headphones or connect to a PA for live performance. 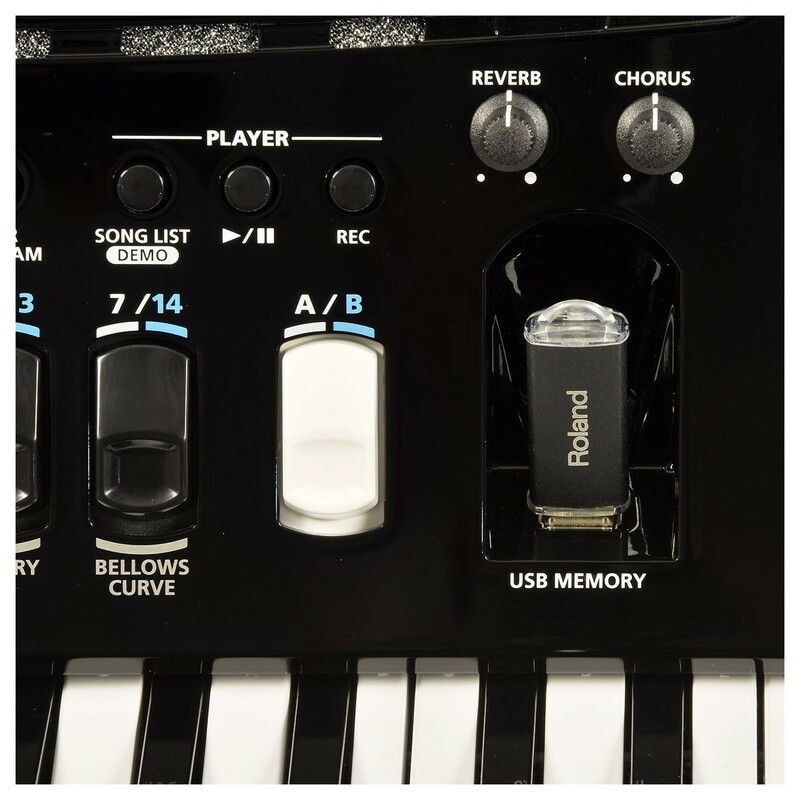 Use the MIDI connector to control other electronic musical instruments, or record your playing to a connected USB stick and share your music with fans. The FR-4XB comes with a powerful sound engine that has been carried over from the previous FR-8XB model. This traditional acoustic v-accordion offers just one dedicated sound and puts an entire orchestra in the players hands, with a variety of onboard sounds that support their individual styles of music. With 100 preset accordion sets and 162 orchestral sounds the FR-4XB v-accordion provides players with all kinds of possibilities. This model is an extension of Roland's latest keyboards, transforming the accordion into an organ, string quartet, or bass guitar. Players can add chorus, reverb, and rotary effects, or accompany their melody lines with the onboard drum sounds. This model introduces so much flexibility for an avid player who wants to experiment in all music styles, or focus for a professional who wants to practise their own unique style. For more sound effects and customisation processes visit the official Roland website. This acoustic playing v-accordion features a layout which includes a mix of familiar features as well as some unfamiliar components too. The 120 left-hand buttons feel recognisable, while the pressure-sensing bellows circuitry allows players to customise the v-accordion to their own playing style. 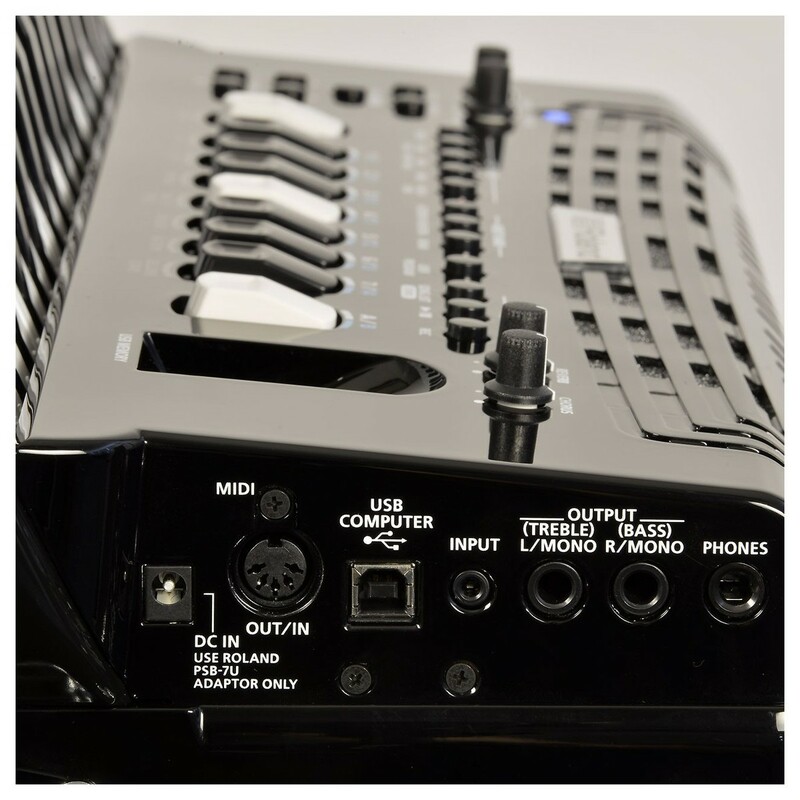 This new digital v-accordion is ideal for travelling musicians, not only because of its compact and lightweight design but because of the onboard technology and the option of powering from an AC adaptor or AA batteries. 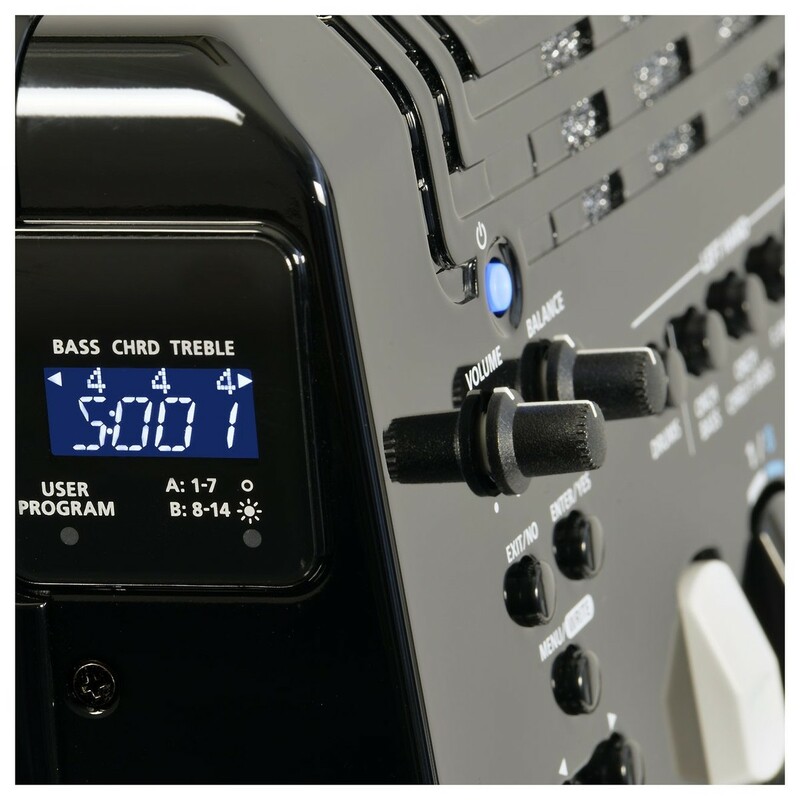 The Roland FR-4XB is capable of supporting you in practice, the studio or on stage. The headphone jack enables you to practice at home without disturbing the neighbors, and when you're on the go, a powerful onboard audio system with two speakers and a tweeter supplies big, full-range sound. Avid music makers can even connect with external MIDI devices like the Roland BK-7m backing module for controllable accompaniment. This model is ready for the stage and is a popular choice for gigging players, providing a direct connection to a venue's PA system via the line out, without the need to mic up a traditional v-accordion. The USB memory port is a favoured feature by many professionals. It offers the choice to use a preloaded USB stick with either your favourite tunes or your own work. The FR-4XB offers so many creative possibilities that can be used when you have just a couple of minutes spare. Such as the onboard recorder that enables a player to record a new piece, then all that's left to do is transfer it across to a USB, and work on it to your earliest convenience. This enables players to quickly and easily express momentary inspirations and then turn them into truly great sounds. The USB export also allows you to safely archive your customised sound settings.